I don't even know what to say. Thank you doesn't seem like enough. I kept tearing up all day on Friday every time my phone beeped with an email, tweet, text or Facebook notification. Once again, I am overwhelmed by the support of this community. Thank you. Reading through the comments on Friday's post, something struck me. Part of all the encouragement included a fair bit of "me too." 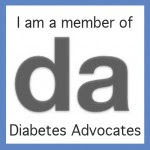 When it comes to diabetes, I know I am never alone. But when it comes to my food issues, I still feel alone quite a bit. Hearing from other people who also deal with food issues means more to me than words can say. Diabetes really effs with our relationship with food. Totally and completely screws it up. Honestly, sometimes I'm amazed all PWD don't have eating disorders. Lee Ann wrote a fantastic and moving post about her journey with body image and diabetes. Stop and go read it now. This article was floating around on the internet quite a lot about a month ago (NOTE: the info it gives on life expectancy for PWD is incorrect. See here for more information). I think I've read it about ten times. And each time I look at it, there's a heaviness in my heart. We all have our own struggles linked to our diabetes. For some of us, that includes food issues and eating disorders. There's shame that comes with having such problems. I've felt it myself. I don't want to admit to other people that my first reaction when I feel stressed or anxious is urge to eat ridiculous amounts of food. It's hard for a lot of people to understand. Why I just can't stop eating, or turn the urge off. Why it's something I have to deal with every single day. It doesn't work that way, because it's not really about the food. It's about me learning healthier ways to cope with my emotions. And I am. Making the decision to start seeing a therapist who specializes in diabetes and eating disorders was one of the best decisions I've ever made. Things have gotten better. When I was struggling over the weekend, I opened up Friday's post and read them comments over and over. Thank you for reminding me that I am never alone. Which is why I'm sharing this. If you're dealing with any kind of food issues or an eating disorder, please know that you are not alone. That there's no reason to feel ashamed. It's not your fault. We are here for you. You can do this. You are so brave to share your struggle so openly while you're in the midst of it, going through therapy and trying to learn what it is and how to deal with it since it isn't really about the food. It's a hard journey, but keep moving in the right direction, and if you take a detour now and again, don't hold it against yourself because detours are PART of the journey. You're going to make it to the other side, and I'll be here waiting for you. You read that article on The Daily Mail about ten times. I couldn't bring myself to read through the whole thing once. I don't know if that means I'm in denial or if I'm unsympathetic - I try to be neither, and I also try to be genuine - but that's an example of one of the internal struggles I face. Some sad stories hit too close to home for me. (No, Jess, your post is not one of them. Yours story is of honesty and inspiration, not tragedy and despair). I think everyone faces emotional conflict of some sort. And I don't just mean everyone with diabetes, I mean everyone. Some survive it with therapy, others turn to aggression or diversion, or literary composition, and even denial or outright defiance. I'm glad you're finding what works for you. Not only are are things getting better (your words), but your form of expression - this blog - is helping and inspiring others. Remember, you battle these emotions because you're human, not because of your diabetes. That's just a complicating factor - one that many of us have. You're not alone. I couldn't be more proud of you if you were my own daughter or sister. You are AMAZING!!! You are an amazing friend! I am sure there are so many other people struggling with the same issues that you are writing about. Every word you write makes the journey easier for them.